It all started with my friend Anna (who has created a beautiful room for her son Eli) and the blog post she shared with me back when I was still pregnant. After many long months of thinking, designing in my head, shopping, cleaning out and throwing away, moving our office downstairs, shopping, putting things together and hanging things on walls, we are done with Tristan’s Montessori-inspired bedroom. I’m pretty thrilled with it and it’s safe to say that it is Tristan’s favorite room in the whole house. We went with a train theme – after all, my college string quartet was called “The Choo Choo Quartet” so how could I not? The train decal on the wall above his bed is from DecoMod Walls Etsy shop. I was surprised at how easy it was to apply to the wall and how much it looks like a stencil rather than vinyl. It’s pretty classy. I was introduced to the Montessori floor bed idea through Anna and I instantly loved the idea – a mattress on the floor that even a young baby can get in and out of on their own. (ETA: It makes sense that this idea was so appealing to me since I spent my baby and toddler years on a floor mattress! My parents were the pioneers of co-sleeping back before it was called such and we had a room full of floor mattresses where we all slept.) No crying to be let out of their cage I mean crib. Tristan has been sleeping on his floor bed since he was about 5 months old and he loves it. We started with it in our room, and just for naps, but gradually worked up to sleeping there most of the night. He gets himself up from his nap and either plays in his room for awhile or comes to find me. We got a Gold Bond 4″ cotton futon from Amazon that uses boric acid as the flame retardent – completely nontoxic. It’s pretty comfortable and I love being able to lay down next to Tristan while he’s falling asleep and then sneak away. (I admit that sometimes I fall asleep there too.) For bedding we got an organic Naturepedic mattress pad, organic sheets from Target, and an organic blanket from Pottery Barn. My super sensitive sleeper seems to do better with all organic. 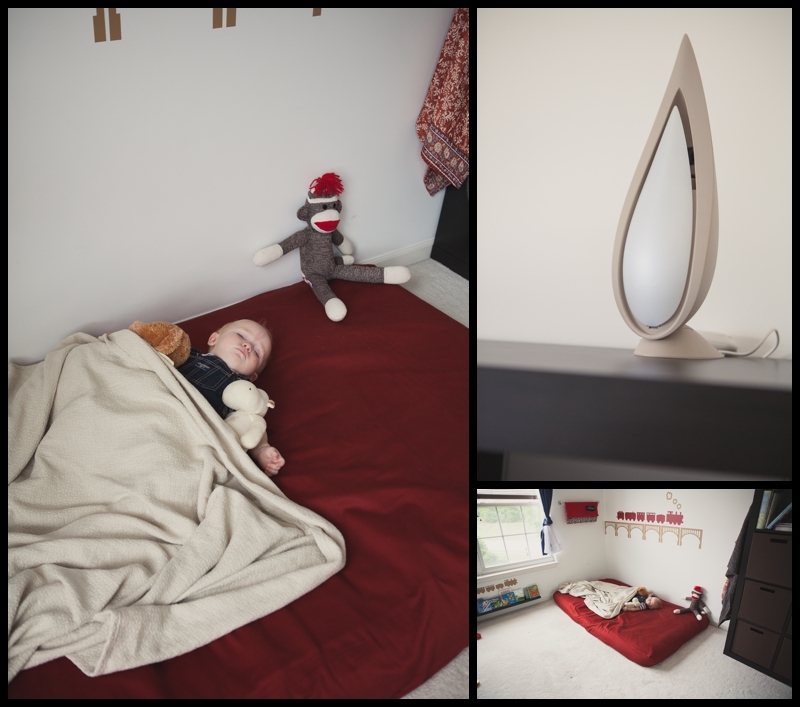 On his shelf there you can see an essential oil diffuser we got from DoTerra – along with their Serenity blend of essential oils, it has completely transformed Tristan’s naps and is helping him sleep better at night too. Not to mention that it smells divine! I loved the idea that I saw in various posts about Montessori rooms of having a mirror at their level. Tristan LOVES this mirror – he greets himself in the mirror and loves to give “the Tristan in the mirror” kisses. Above the mirror we have two canvases from our newborn photo session with Amber Holritz. 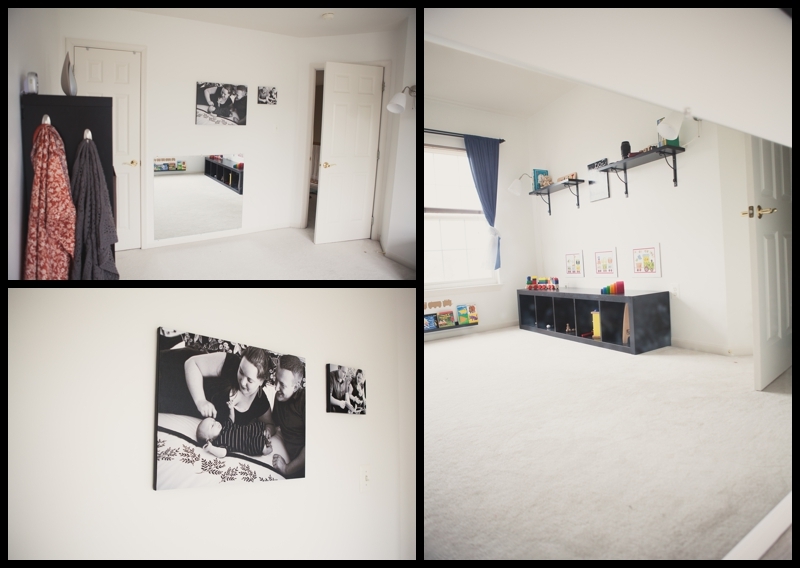 I also loved the Montessori idea of organizing the room at the child’s level – we did put some shelves up higher to complete the visual appeal of the room, but most of the furniture and art in the room is at his level. I guess we did a good job because when a friend of mine – who knows nothing about Montessori – saw his room she commented that she loved how child-sized it was. The low shelf is an Expedit shelf from IKEA – I LOVE their Expedit series (the shelf by his bed is also an Expedit shelf.) I guess I just love IKEA – the wall shelves and lamps are also IKEA, as is the low bookshelf (which is really a photo ledge since the “spice rack bookshelves” I saw on Pinterest were sold out of every IKEA in the country.) The “God Made You” canvas is from The Creative Imperativ’s Etsy shop, the train prints hung at his level on the wall also from an Etsy shop, as was the Tristan name puzzle on the shelf. The Tristan name train is from Maple Landmark. 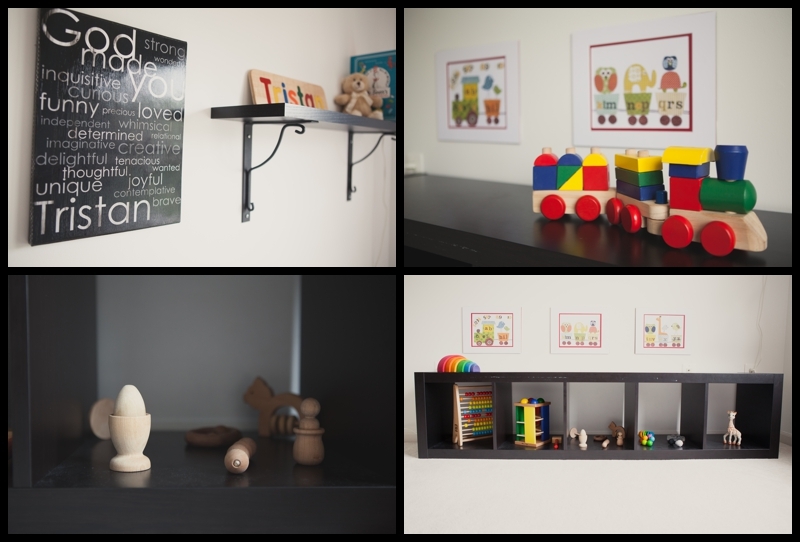 The wooden toys on the shelf are from Melissa and Doug, Haba, Spiel und Holz, and Etsy. I am in love with wooden toys. They are so beautiful and don’t have that “cheap” feel that plastic does. I love love love how this picture ledge bookshelf worked out. Tristan loves pulling his books off the shelf and “reading” them. We used to have the books on his Expedit shelf which you’d think would be just as easy for him to pull them off and look at them, but they went virtually untouched. He also loves standing at the window and looking out across the neighborhood, often with a book on the window ledge at the same time. 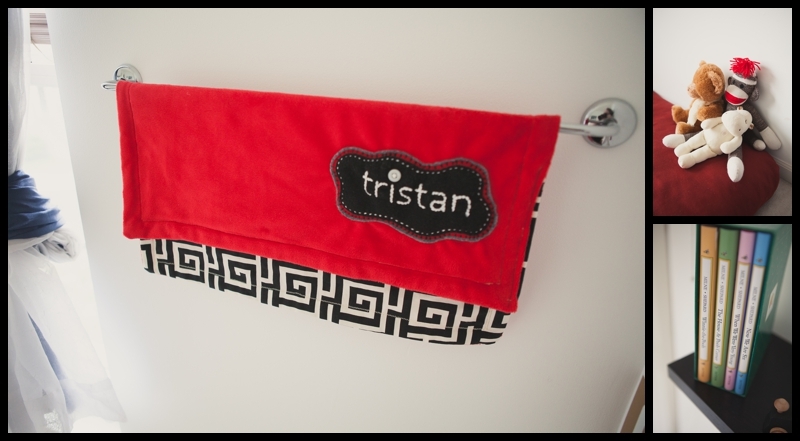 The custom “Tristan” blanket was a gift from our photographer Amber Holritz, made by Ivey Handcrafted. Gorgeous. Tristan loves his little stuffed animal collection and they keep him company now that he’s sleeping full time in his room rather than with us. He seems to be comforted by snuggling with them. (Yes, my kid is a cuddle bug.) We’ve been reading the Pooh books in the evening – Tristan just plays while we read but Mike and I are getting such a kick out of them. And there you have it! Tristan loves his room, and we love hanging out with him there. It is light and airy, peaceful and child friendly. What more could you ask for? Interesting that you say you got the floor bed idea from a friend when you spent your baby/toddler days on a floor bed! Maybe you don’t remember. We had nearly the entire floor of what became Ryan’s bedroom covered in mattresses and we all slept there. Ryan slept on a floor bed for years, you for maybe 3 years before transitioning to your double bed. SO cute! 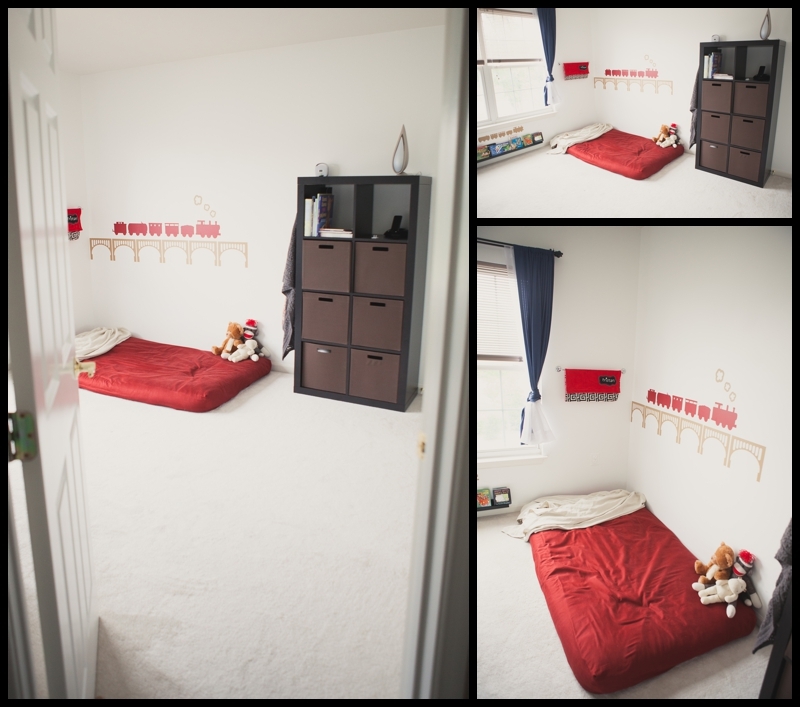 1) – you’ve totally inspired me to think about the kids’ room, now that we have our living room/bedroom under control-ish. And 2) try submitting these to a lifestyle blog! Did you know Grey has a baby blog??? I bet she’d like these! 1) Fun – I’d love to see what you come up with! 2) Great idea! I emailed Grey. 🙂 I love her baby blog! Awesome! I love it 🙂 I need to start reading the pooh books to Eli, he seems to like being read to even if he’s playing around in his room at night. Love how his room color scheme fits your house and everything so well 🙂 great job! I enjoyed your posting as I’m looking for ideas on creating a more Montessori inspired room for my daughter. Question: From which Etsy shop did you order the Tristan name puzzle? You mentioned it above, but I didn’t find a link. Thank you!